In November 2011, writer and artist Jessica Hagy created an illustrated column for Forbes.com called "How to Be Interesting (in 10 Simple Steps)". "Go exploring. Share what you discover. Do something. Anything. Embrace you innate weirdness. Have a cause. Minimize the swagger. Give it a shot. Hop off the bandwagon. Grow a pair. Ignore the scolds." That single page of insight and advice went viral. 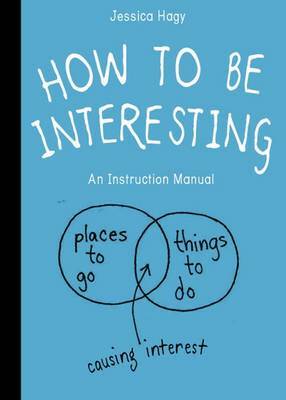 And now "How to Be Interesting" is being expanded into a colourful illustrated book of inspiration. Half Seth Godin, half Shel Silverstein and all Jessica Hagy, the book takes a fanciful, approachable, and personal route toward being interesting. It's pithy. It's funny. It's thought-provoking.